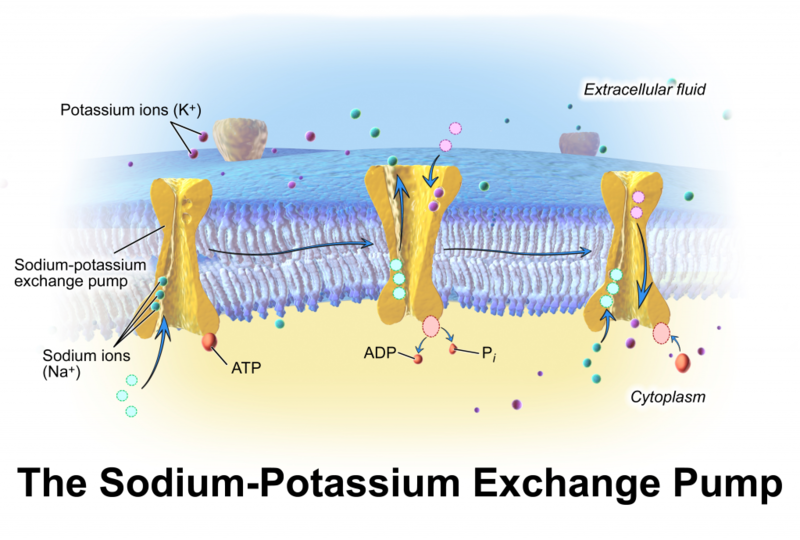 As I said to my tutee, Mumtaz, have a look at this video, which explains the movement of potassium and sodium across the plasma membrane; each of the ions is moved in only one direction by the same transporter apparatus. Sodium is transported out, and potassium is pumped in via a repeating cycle of shape changes in the pump. In each cycle, three sodium (Na+) ions are moved out of the cell, while two potassium (K+) ions enter. The pump has an inward-facing form with high affinity for sodium (and low affinity for potassium, meaning there’s a strong attraction for sodium, but low attraction for potassium); and, an outward-facing form with high affinity for potassium (and low affinity for sodium). It toggles back and forth between these forms through the addition or removal of a phosphate group, which in turn is controlled by the binding of the ions to be transported across the plasma membrane. After watching the video, test yourself with the MCQs that follow. Submit your responses to see the answers. Please share with your colleagues, if they’re also taking the ABPI exam. Sodium-potassium exchange pump image courtesy of:Blausen.com staff (2014). “Medical gallery of Blausen Medical 2014”. WikiJournal of Medicine 1 (2): 10. doi:10.15347/wjm/2014.010. ISSN 2002-4436.
prof premraj pushpakaran writes — 2018 marks the 100th birth year of Jens Christian Skou!!! Thanks for reminding us of this Nobel laureate who discovered the sodium-potassium pump. Here’s to his 100th birthday later this year. Previous PostPrevious ABPI Exam Unit 4.1.5.1 Phagocytes: Neutrophils and macrophages. What’s the diff?